My Mom was a SURVIVOR. A strong woman in her Canadian patriotism, strong in her love of her Irish background, strong in her thoughts, opinions and words. Mom was born in a small Irish community on the banks of the Ottawa River in rural Quebec. She was a child of the Great Depression and survived a very difficult childhood. They were very poor and Mom used to tell me, "had the wolf come to their door, he would have had to bring his own lunch!" It was a time of heavy unemployment and hunger & poor nutrition that led to many diseases and deaths. Mom’s family suffered in rapid succession, losing her brother to TB, then soon after Mom survived diphtheria although her baby sister died of it, and then she lost another brother to tetanus. Her older brother rode the rails looking for work. At the tender age of 12 my mother cared for her own mother who succumbed to tuberculosis. She had to wash & dress her mother & place her into the rough wooden coffin then push it out onto the porch for the townspeople to carry away. Imagine a twelve year old child having to do this. The villagers, afraid of contracting TB, quickly carried her mother's body away to be buried. These were experiences that could make or break the human spirit. Some broke… some never really recovered… some managed to get by. This was a burden that she never did release. Yet, for some reason, Mom was never able to tell us how much she loved us. It seems, in retrospect, that she feared opening her heart too much in case she lost us too, so she seemed to keep herself to herself. On the positive side, because I had desperately needed to feel loved it led to me being loving and openly affectionate and demonstrative of my love for my own two sons. I gave them what I had needed when I was a child. I never blamed my mom for keeping me at a distance nor her inability (from my biased childhood memories) to nurture me the way I needed. I can truly understand this as an adult. At the age of sixteen, Mom was also diagnosed with TB and spent a year in a sanitarium and never did regained the use of one lung. After that Mom and several cousins moved to share an apartment and she found various jobs. One was in a factory building aircraft parts for the war. Somehow, despite little education, Mom found work in the BILLING department of a huge department store. Then she went on to work for the military dealing with the cheques for the soldiers. It always amazed me how hard she worked and how she continued to bounce back from all the challenges she faced. Perhaps it was her Irish stubbornness and pride that keep her alive. And Mom survived...her strong will gave her the courage to fight to live and make her own way, surmounting her many challenges. She eventually made her way to Ottawa with two special cousins, Marjorie Lamothe and Janet Lamothe, where they shared an apartment. Often barely making the rent they used their ingenuity and humour to stretch their budget. They, like many women at that time, had taken over the jobs left behind by the men who went to war. Mom eventually met and married Dad there in Ottawa. Employment was scarce so soon after the war and money was tight. Then I came along. Mom's oldest brother Leo invited them down to St Catharines where he was a Police Sargent, telling my parents that there was lots of work down here. And so, Mom and Dad packed up their things and their young baby, me and took the bus down to St Catharines. But, as it turned out, work was just as scarce here. Mom used to say that the only reason they didn’t go back to Ottawa was because they couldn’t afford the bus tickets. And so they settled here, eventually buying a small country lot and built their own house. Every week, when Dad collected his paycheck, they would buy a few more cement blocks or another load of 2x4s to continue while we lived in a tiny shed at the back. I remember that shed with fold-up beds and a fold-up table. And at one point, not only were there the four of us, Mom, Dad, myself and Susan living there but also Uncle Leo's two kids who moved in during some hard times. So Mom had four kids under five years old to care for. I remember all the years of the most wonderful Halloween costumes that Mom would create for us….weeks of sewing and fitting….we always looked amazing & the other kids often envied our outfits! I remember the family picnics along the canal, rolling down the grassy hills. Our visits to Lakeside Park, Mom busy packing our picnic lunch with her delicious potato salad and egg salad sandwiches on homemade bread. How we sat on the front steps waiting till Dad came home from work to take us there and somehow Mom always found an extra nickel for each of us so that we could ride the merry-go-round just one more time. I cherish those happy summer nights around the campfire at the cottage, my hair smelling like smoke as we burned toast over the flames. Mom’s muttering when her little flower & vegetable gardens had been eaten by the farmer’s cows until she planted plastic flowers instead. Man, they were ugly flowers but the cows never touched them! 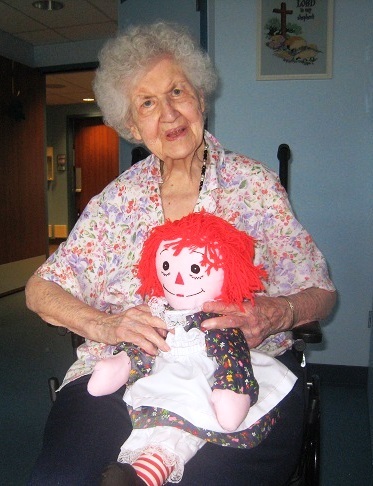 I remember Mom hand sewing, stuffing and dressing hundreds of Raggedy Ann dolls and Pooh Bears. Her fingers would bleed sometimes but she sold them and earned enough money to buy our very first television set. And I remember how we would tour the country back roads up north to find and harvest the wild crab apples and abandoned pear trees along the ditches. And, in the Fall, our basement shelves glowed with the golds and reds of dozens of glass Mason jars filled with her homemade applesauce, chokecherry and crab apple jellies, canned peaches, pears and plums. I remember how Dad proudly came home with several bushel baskets filled to the top with freshly-caught smelt and I can still see Mother standing at the kitchen sink with her apron on, growling at all the tiny silver fishes still alive and swimming in the water....I know she was wishing that Dad had been a much less-proficient fisherman that day! As the years went by Mom faced numerous medical issues. She lost three babies and faced cancer several times. Her TB-weakened lungs made her more susceptible to pneumonia. Mom came from an age of horse & buggies, wood stoves in the kitchen, drawing water from a well & self-suficiency. She witnessed an incredible change in technology and the way of life in her ninety-two years. I recall her first microwave. We gave it to her one year and it took her two years to finally accept and use it. (she was suspicious of this “new stuff”). She used to tell me that she needed new mirrors in her house because the old ones only had “little old ladies” in them. Yes, my Mom had a wry sense of humour. When she eventually moved into a retirement home at eighty-five, I asked her if she found any suitable gentlemen companions. She looked at me, sternly, then told me “no, not yet... she was looking for a rich one with one foot in the grave and the other on a banana peel." Her deep-set sharp hazel eyes would twinkle at her own naughtiness. That was my Mom...you never knew what to expect. Yes, Mom's stubbornness came at the price. Though it served her well to survive, she and I butted heads alot in the eighteen years after my Dad died. Mother was of that generation when the “man of the house” did everything - this led to many “discussions” between her and I over her rigid views on values, accountability and “tough love” regarding an adopted younger sibling who lived in serious addiction. I fought to protect my Mother from emotional and financial abuse but it was a constant struggle...Mom chose to see my efforts as an attack on my sibling who was controlling Mom thru maniplulation as only a strong addict can do. Mom refused to see an objective perspective, what was REALLY happening, and suffered for it. In some ways I was so fortunate that her growing dementia caused her to “forget” to be mad at me. She forgot her sadness and grief and she no longer saw me as “the enemy” but as the one who was always there for her. She loved pretty things and I was able to buy her stylish blouses in bright jewel colours. Mom delighted in them and she was known by the staff to change her clothes several times a day. She always had been a “fashion plate” as they called it way back in the forties. To give Mom some peace, I developed a Spiritual Mandala Colouring Book for her, called "A BOOK OF CHOICES", to help Mom remember to live in the present, in a more positive manner, instead of always reliving the sad past...I truly believe (as do a number of nurses & some others in the medical industry who have seen the colouring book and read the affirmations on each page), that my book can be extremely helpful to seniors now struggling with the growing spread of dementia. It is my hope that this book can help many others in honour of my Mom. I miss my Mom, but I have inherited Mom's stubbornness and tenacity. I do my best to use that strong force of Mom's characteristics in a positive manner to help others. Mom's tough strength courses fiercely in my blood and I fight the fights that need to be done with that same stubbornness. My life with my mother taught me that the past has it's purpose in learning but can control your future until you recognize the patterns. Negative experiences all have a positive element when you look from another perspective. My passion can be overwhelming to some but I can hear my Mother's energy now, cheering me on to survive and push forward...to allow myself to be the me that I am meant to be...to value the past but savour the present and to carry a positive outlook to the future. My Mom gave me courage, strength, tenacity and a strong emotional spirit. Mom was a survivor. So am I. Thank you, Mom, for all that you taught me. I love you. You live forever within me.